Most days, it feels like the first thing I hear in the morning. Before my feet even hit the floor, a toddler is prying open my eyelid saying, “Mom? Mom, I’m ready for breakfast. I’m hungry.” Then they are finally fed, dressed, and ready to get on the bus and run out the door, and I see food on their faces and sticky hands and they still want one more snack. And don’t even get me started on packing lunches and snacks for school! Of course, what are the first words you hear off the bus? “I’m hungry, mom!” And that’s just the kids – my stomach growls at 10:00 am . . . too early for lunch and breakfast seems so far away. Late night snacks in bed? They happen. They happen to all of us. So, with almost constant demands for snacks, it is all too easy to reach for prepackaged foods. My personal downfall is fruit snacks. I mean, they even say “100% fruit juice!” which makes them seem healthy! And that chewy, gummy, fruity flavor . . . Don’t get me started. Store-bought granola bars, cereal bars, power bars – bars must be good for me, right? And snacks are actually a great thing! They help keep blood sugar from spiking and dropping throughout the day, boost energy and alertness, and can be an opportunity to add great nutrients to your regular diet. 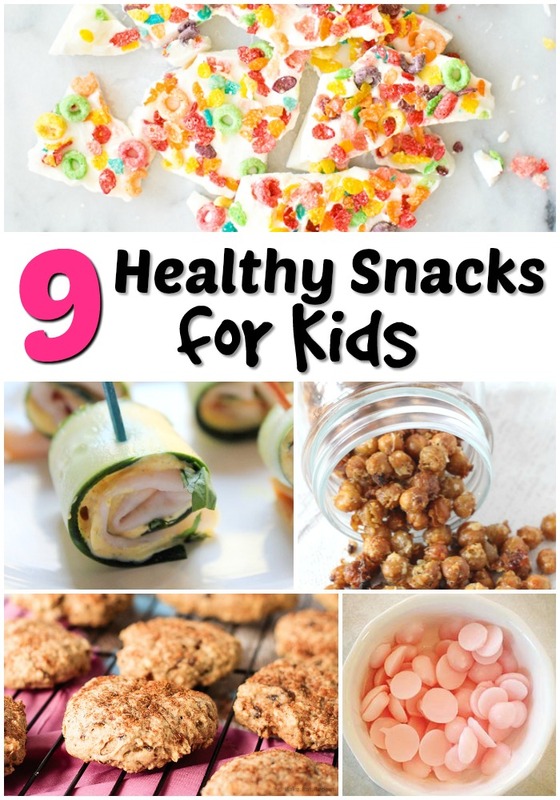 But the goal is to make healthy snacks for kids (and yourself). Which can be a challenge. But start here: Healthy Snacks for Baby. It really doesn’t get easier or faster than these whole-food options your baby will love! 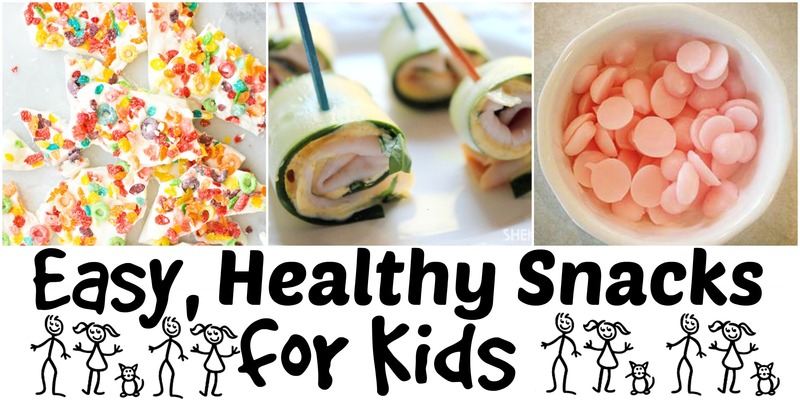 For older ones, try these healthy snacks for kids! They are quick to make, provide essential nutrient, and will help you be prepared for any eventuality. Cereal Yogurt Bark – Use your own homemade granola or a healthy cereal option to make these even more nutritious. Apple Oatmeal Breakfast Cookies – Great for a snack between breakfast and lunch. Frozen Yogurt Dots – Use greek yogurt to amp up the protein in these fun yogurt bites! Healthy Rice Crispy Treats – Only 3 ingredients, these are easy to make and don’t have all the processed sugar in the store bought variety. Roasted Chickpeas – Mix it up with this yummy, savory snack! No-Bake Oatmeal Energy Bites – This is a protein filled and healthy snack for kids that will be a great option for Mom and Dad too. Baked Sweet Potato Chips – If your kids are chip munchers, try these homemade chips! They are so yummy and a much better alternative. Cucumber Roll-Ups – Stay away from empty carbs by putting your typical sandwich fillings into a thinly sliced cucumber. Apple “Cookies” – Three different ideas for making apple slices taste delicious. 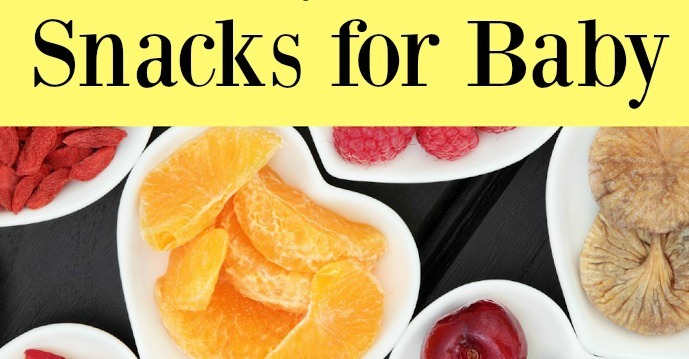 So – make these healthy snacks! And stock them somewhere in the kitchen where the kids can find them. Maybe tomorrow morning, you will actually wake up without a toddler in your bed, poking at your eyeballs! Granted, he may be on the floor in the kitchen eating all the Oatmeal Energy Bites. But we have to choose our battles.